Johnny Shines was a highly gifted guitar player and a literate and poetic composer of blues lyrics. He was, as well, one of our greatest bluesmen. However, through unfortunate circumstances, he never attained the success and fame of his contemporary, Muddy Waters, or his idol, Howlin’ Wolf. Johnny Ned Shines was born in 1915 in the community of Frayser, Tennessee, which is now part of Memphis. He lived in that area until he moved to Hughes, Arkansas, when he was 17 to work as a farm hand. Even though his mother was an accomplished guitar player, Shines didn’t take up the instrument until he was 16. His early musical influences were the phonograph recordings of Blind Lemon Jefferson, Scrapper Blackwell, and Charlie Patton, but Johnny idolized Howlin’ Wolf, who was working out of Hughes in the early 1930s. At that time, the Wolf’s primarily instrument was the guitar, and Shines followed him around wherever he performed, trying to learn his licks. Indirectly, it was Howlin’ Wolf who provided Shines with his first opportunity to perform in a club. 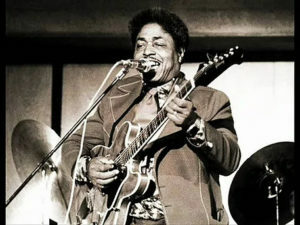 Wolf was taking a break up one night in a juke joint when Shines picked up his hero’s guitar and proceeded to “get that joint jumping.” Shines’ admiration for Howlin’ Wolf even earned him the nickname “Little Wolf,” when he started playing “semi-professionally” around the Northeast Arkansas area. Also, he would frequently hitch-hike the short trip back to Memphis to play for tips at the Saturday afternoon gatherings at Church’s Park, now known as W. C. Handy Park, on Beale Street. In Memphis, Shines would sometimes team up with a piano player known only as M&O (after the Mobile and Ohio Railroad that ran through the heart of the Delta). It was M&O who put Shines on to Robert Johnson. At first, Johnson was standoffish toward Shines, but eventually they did get together. In fact, Johnson came to Hughes looking for Shines. One day, when Shines came into town from a trip, a friend said, “There’s a boy up there in your bed, says he knows you–a slim, dark fellow that sings like a bird.” Right away, Shines knew that his uninvited houseguest was Robert Johnson. They played fish fries, jook joints, house parties, chitlin’ suppers, levee camps, sawmill, and coal yards throughout the South until they ran into some trouble in Helena, Arkansas. One of Shines’ cousins, Calvin Frazier, who was with them at the time, got into a shooting scrape with his father-in-law, and they decided to make a prudent move toward the Canadian border. Shines and Johnson spent several months up north with frequent forays into Detroit to play club gigs. On at least one location, they appeared on a Detroit radio show, the Elder Moten Hour, playing gospel music. After they left the border area, Shines went to New York and Johnson returned to the South, ending an exciting if not profitable musical collaboration. Shines didn’t even hear that Johnson had been killed until 1940, two years after the fact. In 1941, Johnny Shines moved to Chicago and soon made his place in the club scene, but he never became a fulltime professional musician because he held a day job and only played music after work and on weekends. He would sometimes put together a band to play out of town dates. One of his groups, that Dukes of Swing, was together for two or three years, playing at a club in a Chicago suburb. In 1946, Lester Melrose recorded Shines for Columbia Records, but for some unknown reason, the sides were not released until 1971. Shines’ next attempt at recording met a similar fate: he cut two sides for Len Chess of Chess Records, who wanted to call him “Shoeshine Johnny,” a name Shines resented; but again, these records were not released.